This German engineered Shaving Brush has been manufactured using rare Silvertip Fibre Bristles designed to out-perform original Silvertip Badger Hair. 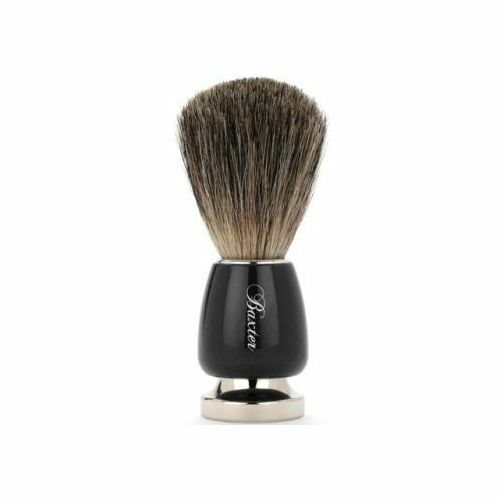 Created by the master craftsmen at Mühle in Germany, this brush comes with a standard of distinction only achieved by the traditional handmade technique of piecing together a luxury shaving brush such as this. A weighted resin handles carries the Jack Black branding on a luxury chrome base-plate. Create the ultimate lather with this dense badger hair Shaving Brush. Manufactured using on the finest grade of Silvertip Badger Hair, this acutely engineered shave brush has the ability to hold lots of water which translates into lots of rich & creamy shaving lather, thus makes your shave more comfortable and more effective. The hairs in this brush have been trimmed from the base and not from the tip, this ensures that the natural shape of each strand is maintained offering the very best shaped tips to maximise comfort and performance. Dip the tip of the Brush into hot water and shake off the excess. Using circular motions, gently work the brush into your shave soap or cream until you have produced a creamy lather. Apply to the skin in upward strokes. Keep it dry when not in use and stand it somewhere ventilated.